“From Hiroshima to Hope” is an event commemorating the bombing of Hiroshima, Japan that occurred on August 6, 1945. 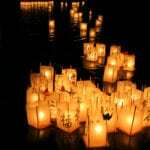 The evening features musical performances, a Buddhist meditation, and floating lanterns on Seattle’s Green Lake.Last year, about 1200 lanterns were set afloat. Stan Shikuma participates in the event each year with the performance group Seattle Kokon Taiko. He describes the purpose of the event with KBCS’s Yuko Kodama. “From Hiroshima to Hope” occurs Monday, August 6th, beginning at 6pm. It’s held just south of Seattle’s Green Lake Bathhouse. The lantern floating begins at 8:15pm.